Six pieces of cultural relics that have been sorted out from among 13,329 pieces of stored gems around China in the past two years were unveiled in Beijing on June 20. They are entitled "China's Folk National Treasures." They are respectively the Pot of Duke Qin in late Western Zhou dynasty (1100 -771 BC); the scroll "A Hundred Birds Paying Homage to the Phoenix" in the Qing Dynasty (1644-1911); the Chinese chess manual scripts "the Deep Pool, Infinite Sea" in the Qing dynasty; the modern-age Xiuyan Jade Dragon Bed; the present-day sandalwood carving "Celebrations at Jasper Lake, A Legendary Wonderland Where the Fairy Queen Lives," and the Qing Dynasty Wood Carving Screen Wall . These national treasures have been kept intact through the centuries.. In order to guarantee their safety, an insurance policy has been purchased for these six folk treasures from the Beijing Sub-branch of the Sunshine Property Insurance Joint-Stock Co., LTD. at a total cost of 310 million yuan (or some 40 million US dollars). 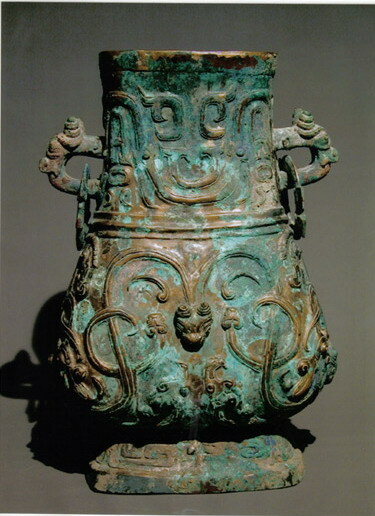 The 42.3-centimeters-high pot, one of the bronze artistic gems in ancient China, is intricately embellished. Around the inner brink of the pot are two lines of Chinese characters meaning "it was the Duke of the State Qin that had the pot made." Experts confirmed that the pot was made as a ritual vessel for the Duke of the State Qin, a ducal state in late Western Zhou Dynasty. The pot was purchased by the noted Taiwan collector Hsu Yu-hai for a huge sum of money and returned to China in recent years. The scroll "A Hundred Birds Paying Homage to the Phoenix"
The 7-meter painting scroll "A Hundred Birds Paying Homage to the Phoenix " is a masterpiece of Qing dynasty painter Shen Quan, who distinguished himself for his flower-and-bird painting works. 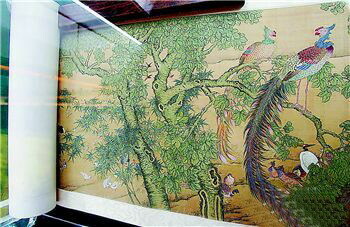 It's a piece of meticulous painting creation with fine, delicate strokes in dark ink and rich colors. In this painting, there are approximately 300 lively birds, such as phoenixes, peacocks and golden pheasant, all with beautiful feathers against a backdrop with Chinese parasol trees, willows and peach trees. The painting master Shen Quan used to be invited to Japan to share his superb painting skills. Immediately upon his return, Shen Quan did the masterpiece "A Hundred Birds Paying Homage to the Phoenix" with the pigment presented to him by the Japanese emperor. The scroll was purchased by a curio collector in 1975 at Liulichang in Beijing, at the cost of 180 yuan, which was relatively expensive at that time.